I am so loving this ! 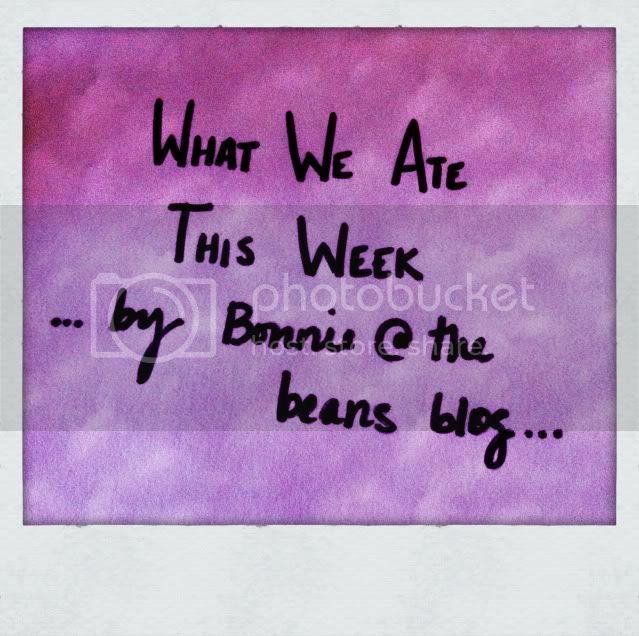 I love looking back on the week that was ... Would love to see what the rest of you are eating too ! How 'bout it ? Anyone want to join me ? Often at the end of a shopping week, we will just have something simple. This was not only the end of the shopping week, we also had been away for the weekend and needed something easy. We thought omelets because we had plenty of eggs. Well, we thought we had plenty of eggs. But the second dozen, which I had gotten from someone at work who has chickens, was less than pleasing ! Every egg had two yolks and something that looked like blood in it ! We were grossed out and not sure what the deal was so we didn't use them. That meant we had to split the one omelet we had ... I put a big chunk of feta and avocado on the side and called it good. 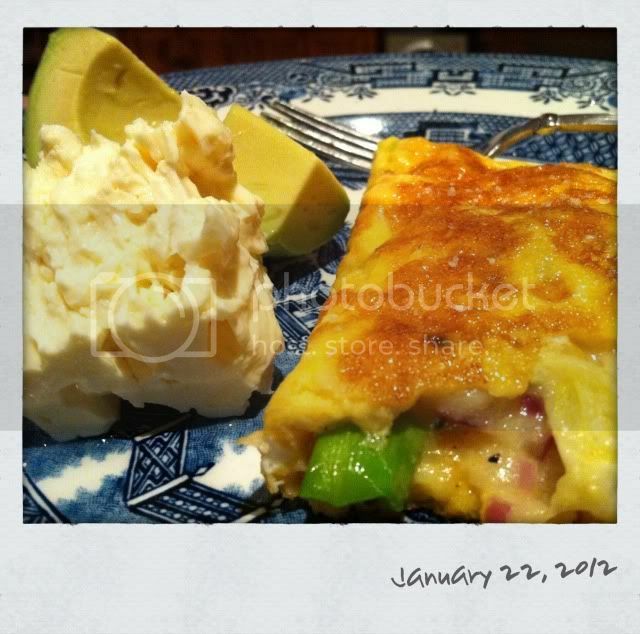 This omelet has spring onion, black olives, pine nuts, feta and tasty cheese in it. Oops ! Totally forgot to take a photo ! 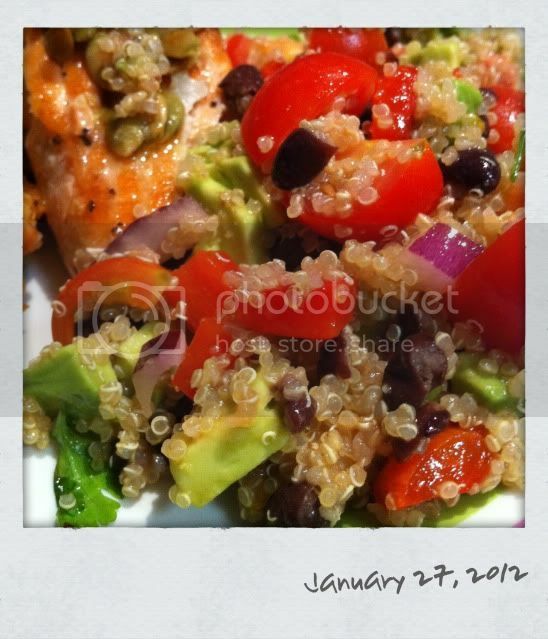 I had been at Zumba while this was in the oven, came home to a bowl already served up, sat down and ate ! Unfortunately that means I had to draw the picture ... drawing is not my strong suit ! 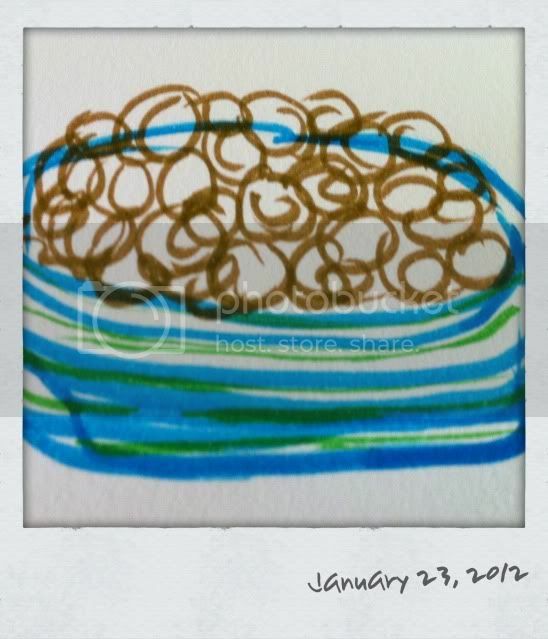 What I ate, not that you can tell from my drawing, is my Mom's mac and cheese ! This was another throw together meal. Just using up what we had. It's garlic and coriander chicken (minus the beans sprouts, didn't have any of them), jasmine rice, and some zucchini that I sliced (kinda thickly) and them sauteed in a tiny bit of olive oil, sprinkled with lots of garlic powder and a little bit of rock salt. I LOVE zucchini this way ! 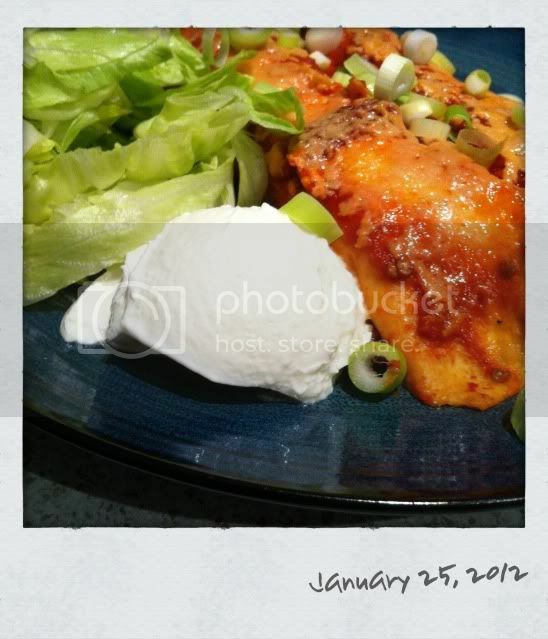 These Low-Fat Chicken Enchiladas were delicious but SUPER SPICY !! We fed the kids earlier because I suspected they would be over the top hot ! We smothered them with Greek yoghurt and iceberg lettuce to dull the spice to an edible heat ! 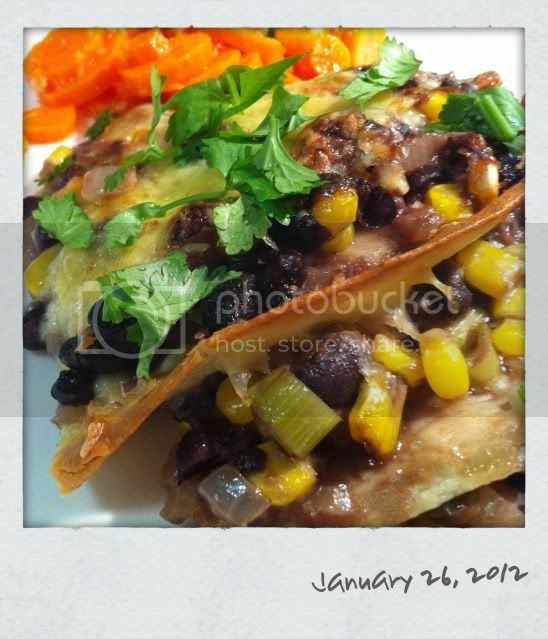 I loved these black bean stacks ! So yummy ! Originally found them here but I did a few things different ... here's what I did. 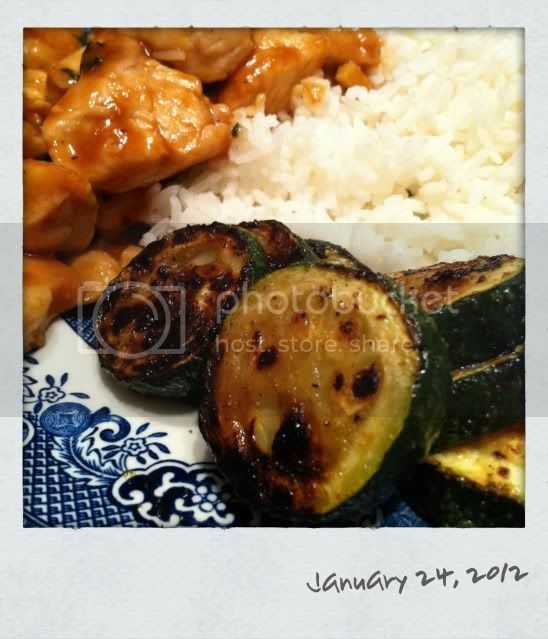 I served these with these yummy steamed carrots with garlic-ginger butter (only 69 calories per serve!!). I couldn't find baby carrots so I just chopped up normal carrots ... they were tasty. We love this salmon with pepita-lime butter. It's so easy to make too ! You just grill or pan fry the salmon with a bit of olive oil, salt and pepper. Toast 2 tbls pepitas (pumpkin seeds). Melt 1 tbls butter and then add a bit of lime zest, 2 tbls (or the juice of a small lime) lime juice and a pinch of chili powder. Drizzle this on top of the cooked salmon. SO GOOD ! Went out to dinner last night ! So yummy ! 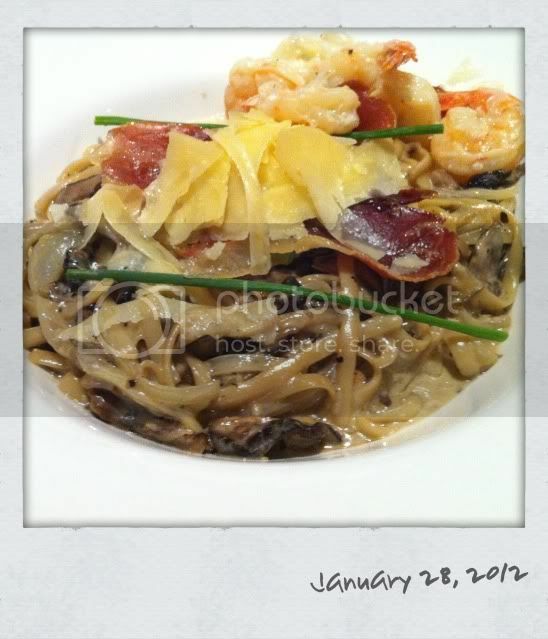 I had "Creamy Prosciutto and Wild Mushroom Carbonara" with a side of creamy garlic prawns that I added to it.